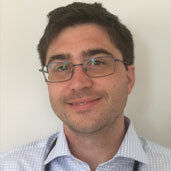 Steve studied medicine at Oxford University and King’s College, London and after working in the UK moved to Joondalup Emergency Department. He relocated with his wife to Albany to complete his general practice training, gaining further experience in community palliative care, aboriginal health, paediatrics and minor surgical procedures.He also spent time in the local hospital ED and wards. His interests include men’s health, minor surgery, pain management and preventive health. He is qualified in dermoscopy and has a special interest in mole checks and early skin cancer detection. Outside of work he enjoys walking, wildlife, photography, DIY and spending time with his young daughter.